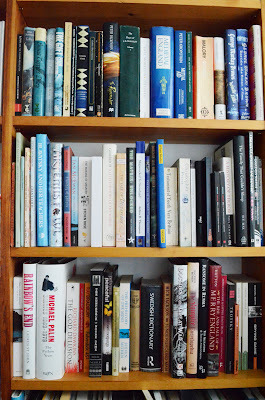 "A few years ago I moved into a tiny cottage, and though I was pleased to see that the former owners had crammed as many bookshelves as possible into it, I still had to get rid of a lot of my books. What's left is (apart from one bookcase of treasured items) a rather random selection. This is one such example - I resisted the temptation to 'tweak' what was in here before I photographed it for you, but the result is probably a good indication of what you might find anywhere in my house. Looking at this photo, I was first amused to see that there are at least three books I hate on there. I'm not telling which ones, but that either goes to show that I'm a tolerant kind of fellow, or too lazy to throw them out. Moving swiftly past things which should never have been responsible for the felling of trees, I stop at the first of an all-time favourite lurking here - Treasure Island. It's one of those books that lots of people have never read, and what a truly great story they're missing - dark and sweltering with evil! Also here, I see a few books I've used in research for some of my own - next to Treasure Island is a wafer thin copy of The Oresteia - which I cribbed from for The Foreshadowing, and on the shelf below is Testament of Youth, which was for the same novel. Along the row is The Family That Couldn't Sleep (Kiss of Death), and underneath that, several books to do with Russia and Arthur Ransome, used when writing Blood Red, Snow White. I can also see lots of books here that I hoped might provide ideas for novels. But which didn't. Damn them to Hell. I see a few titles that are vestiges of my 'career' in publishing, and a few books by other favourite authors; Mervyn Peake, Peter Dickinson, Chris Priest (though not always my favourite of their books - they must be in the case of treasures. I hope). I see some books relating to my continual battle to learn to speak better Swedish, and I see some books by friends, along with one of the first books I ever read; the Ladybird edition of Richard the Lionheart, which my brother and I 'improved' by the addition of speech bubbles on the illustrated pages. (King Richard saying 'You twit" to Saladin, that kind of thing). Clearly I had an early grasp of realistic dialogue. I see a book by someone who I admired until I witnessed his appalling table manners. I see a book by a royal Russian Anarchist next to a Romanian religious historian. I see a book by a man who doesn't believe in God, and I see a book by a god who doesn't believe in men. I see two books by a man who can talk to dead people. I see two of the most overrated books of all time, in my opinion. And I see a couple of books of posh hotels to stay in, revealing another habit of mine - that when reading and writing get too much, I'm happiest to run away somewhere quiet, as long as it's somewhere with a decent martini." Thank you Marcus for your bookcase showcase post! The wonderful Nina has offered me 2 copies of Marcus's Midwinterblood for a giveaway. If you would like to enter and are based in the UK please leave a comment below with a way for me to contact you (either email address or twitter name). I will pick winners next weekend. I never tire of looking at other people's bookshelves. I can see three books I wouldn't give shelf-space over to - I wonder if it's the same three? Treasure Island is an absolutely fantastic adventure - I read it long ago at primary school and Hubby read it to our youngest daughter as a bedtime book, with lots of silly voices. I remember reading treasure island many years ago but i cant remember much about it :/ i should probably re-read it some time. 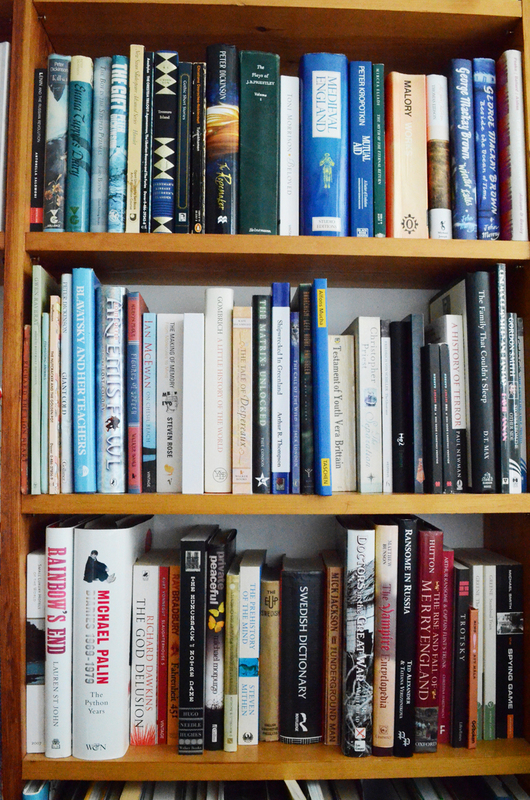 I love looking at other peoples bookshelves, i just think you can tell alot about a person by the books they read. I always love seeing other bookshelves! I love see what books people have. Make me want to read them all !